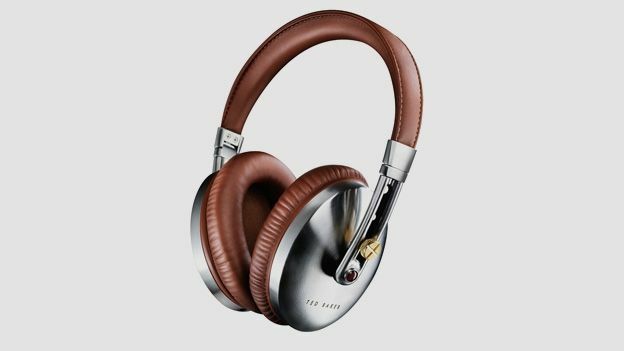 Can the Ted Baker Rockall compete with the best headphones around? Ted Baker is known for togs rather than tech, but it's looking to change all that with its first pair of headphones, the Ted Baker Rockall. As you'd expect, they're a beautiful piece of kit. But unlike other fashion brands that have jumped on the tech bandwagon in the past - Paul Smith, we're looking at you - it's engineered the innards in-house, rather than slapping its name on another company's cans. They're not crazy expensive either. At £180, they're only a tenner more expensive than the B&W P3, and almost half the price of the B&W P7. But how do they stack up? Let's ready our shell-likes. These cans have all the trimmings - the backs of the ear cups are made of brushed stainless steel, while the ear pads and headband are a faux leather material that feels as close as you can get to the real thing without involving a cow. They fold as well, and have their own neat little Ted Baker carry case. Very handy. The headphone cable is flat, and completely tangle-free, which is a godsend. It has basic volume controls, and a mic so you can use it as a handsfree kit for iOS devices. You can adjust the cups with the smooth sliding mechanism. At the risk of sounding like Alan Partridge, it's a nice action, and it really shows how much care has been put into the build quality. They are quite heavy though, tipping the scales at 278g. Though that is quite a lot lighter than the Bose QC3, which weigh in at 450g. They're not the smallest pair ever either, measuring up at 190x160x70mm. They come in a range of colour options too. Our personal favourite is the brushed silver with tan - very spitfire pilot - though they also come in silver and black, and brushed champagne gold with white. Not sure we can pull off that last one. The Ted Baker Rockall do feel a bit heavy, which had us worrying about our poor neck. But it turns out there was nothing to worry about - they're very comfy indeed, thanks to all the padding. They don't pinch your ears like the Sol Republic Tracks either. Rather, the ear pieces are big enough to encase your whole ear. They do still let in a bit of background noise though, so if you're in a busy environment, you'll have to turn the volume up. We tested them in scorching 28 degree heat, and they didn't make our ears sweaty either, like some leather pairs. You do notice them when you're wearing them though. But we suppose that's inevitable for a pair this of this size. As we say, these cans are very well put together, so they feel like they'll take a few knocks. Not that you'd want them to, after you've spent £180 on them. They do have one design quirk. The cable splits in two - one labeled Right, the other Left - to plug into both ear cups. But the ear cups aren't labeled Left and Right. So not everything has been thought through as thoroughly as it could be. Now, the all important question. How do they sound? Thankfully, very good. The sound is very even, not too bass-heavy, which makes for a clean, nicely rounded listening experience. They might not match the Beats Executive in the bass department, but these are a cut above both in terms of style and clarity of sound. Having said that, the sound could be a bit richer. It occasionally sounded a little flat to us. Plenty to like here: these cans look great, sound very good, and won't break the bank. All of which makes a nice change from the usual cash-in when designer labels do tech.